So true story… a few months back I was driving my littles to the park (only driving about 15 mph since we were in a residential neighborhood) when I collided drove too close to the curb and blew my front passenger tire. My husband and I put the spare on in its place and headed to the tire shop where they quickly got me back on the road with a replacement tire and my spare put back in its place. The employee I was speaking to told me that because the tire was in fairly good shape (besides the golf ball sized shredded area, oops!) it was eligible to be recycled. I asked if he meant upcycled and he looked at me as if asking, “Girl, what ARE you talking about?” Haha! 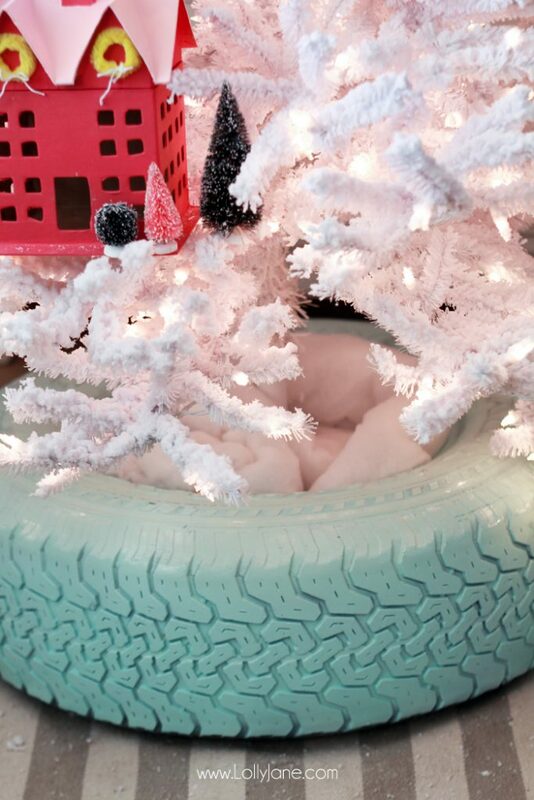 I guess he didn’t realize I was a DIY blogger or see where I was going with my line of questioning… like making a Recycled Tire Christmas Tree Base! 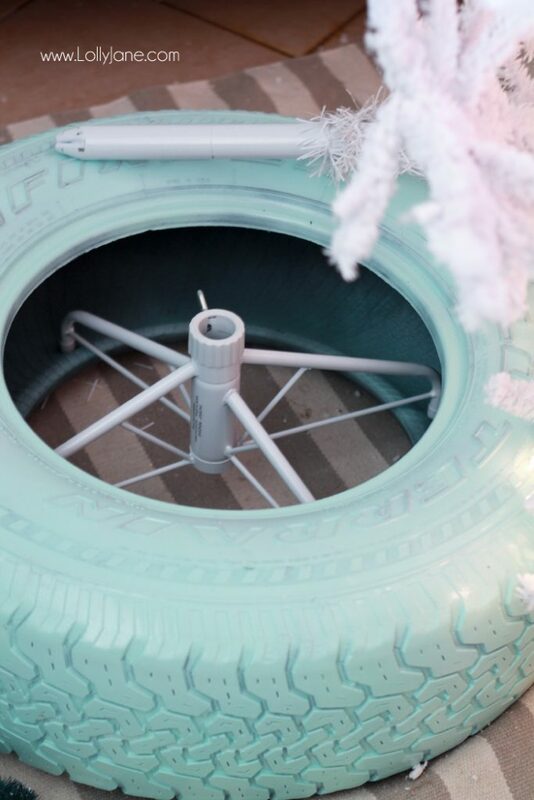 Thanks to the partnership we have with Discount Tire on this post, we are sharing our recycled tire DIY project for holiday gift inspiration and it was so fun to think outside of the box! (A quick shout out this local company here in the Valley of the Sun, Discount Tire/America’s Tire, based in Scottsdale, Arizona. It is the world’s largest independent tire and wheel retailer and currently operates more than 900 stores across the country. Sweet!) 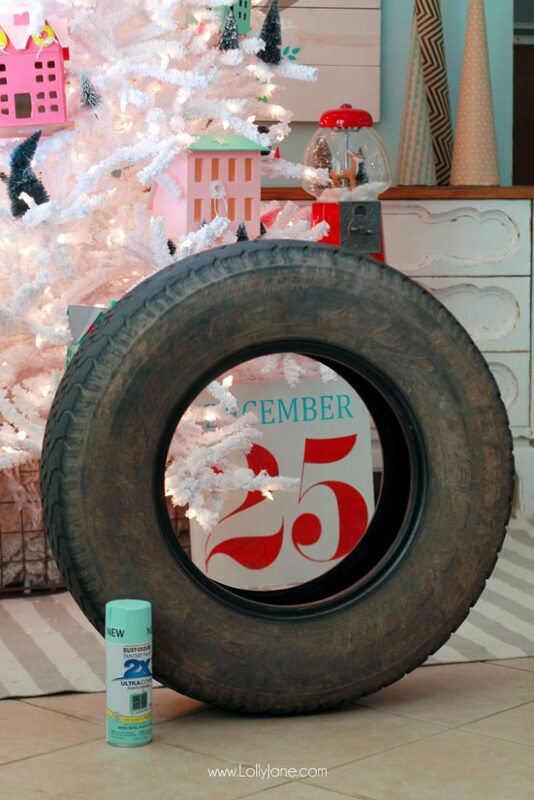 So here’s what we started with, an old dusty tire that needed a good spray down AND a good spray paint! 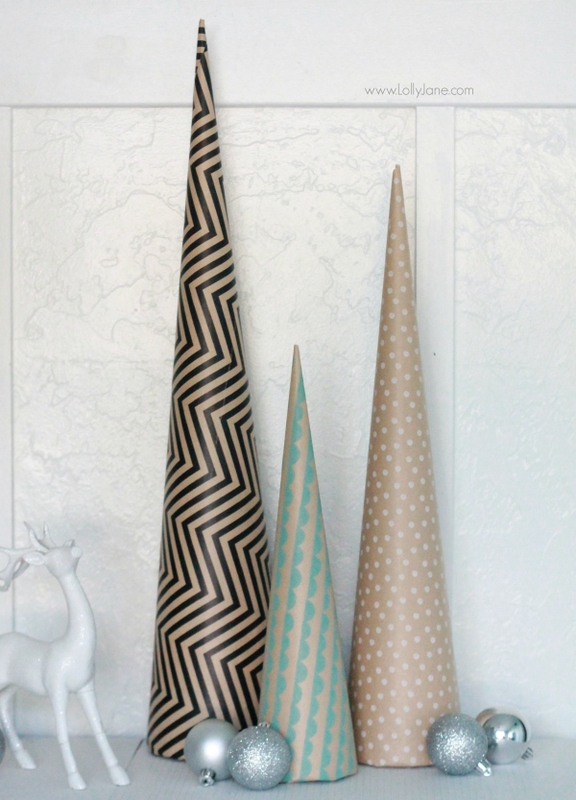 We used Rust-Oleum’s Seaside (the perfect aqua color!) on the outside of the tire with 2 light yet even coats. After letting it dry for about an hour we just rolled the tire indoors and set it down then added a standard Christmas tree stand inside. We put the tree back together but it was missing something. 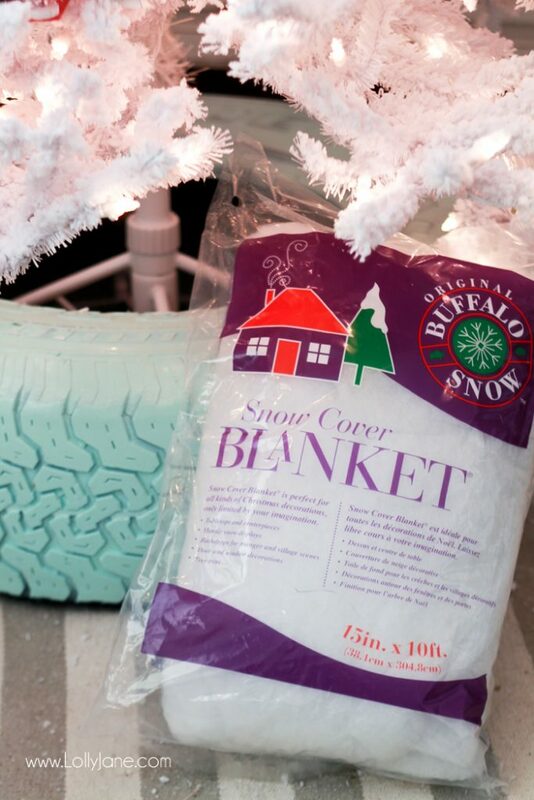 Kelli had this cool snow cover blanket material so we just put it over the standard tree stand to hide it. 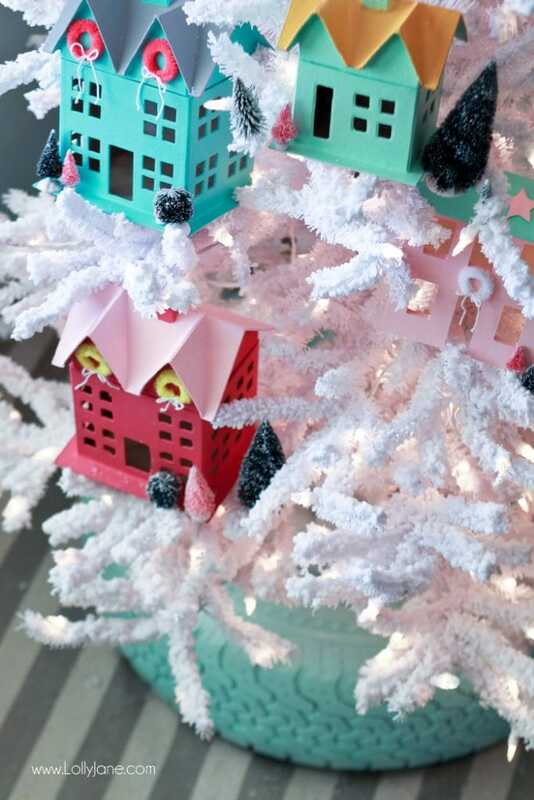 See how well it goes with her pretty flocked Village Christmas Tree? Love! 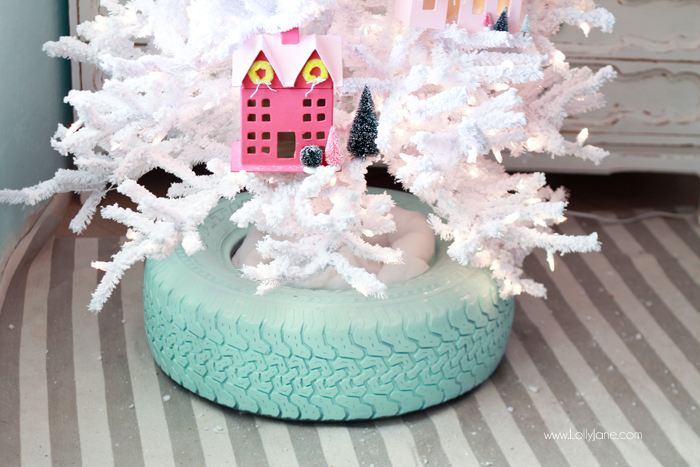 The fresh aqua tire brings in the colors of the oversized “ornaments” and pairs well with her light blue walls perfectly! When her son walked in from school he had to ask if that was a tire sitting under the tree as it threw him off for a minute. LOL! 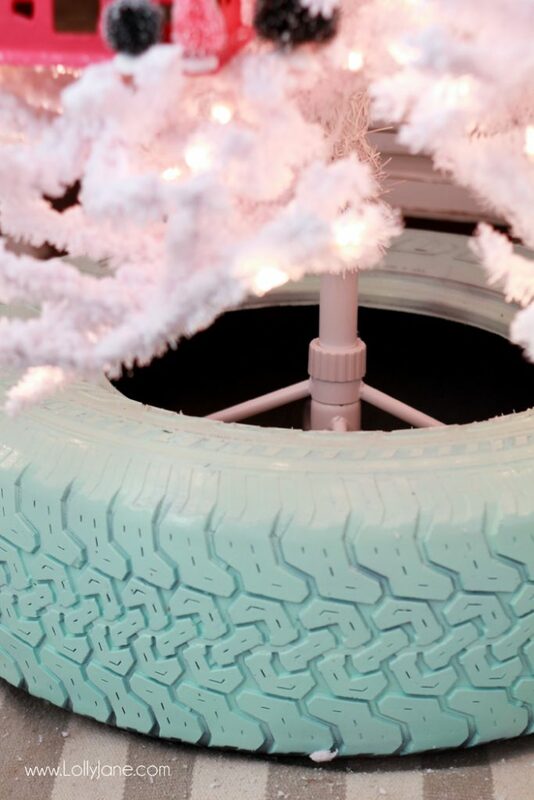 Instead of leaving your old tire at the shop, snag one or two to make something creative out of it! We’ve seen planters, baskets, swings, dog beds and ottomans made from old tires and they are super cool… and very cheap to DIY! That is brilliant and I love the color – so fun and pretty! Happy weekend, ladies!! Hi Lolly Jane Girls ! 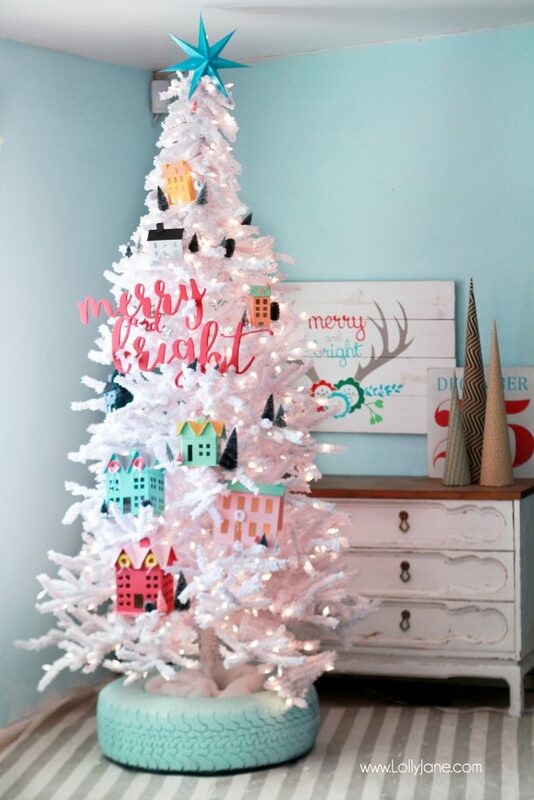 I just had to tell you that I stumbled onto your recycled white Christmas tree just now, & it’s my most spectacularly awesome favorite this year ! I am crazy-bananas over it! Thank you so much for the beauty & inspiration ! 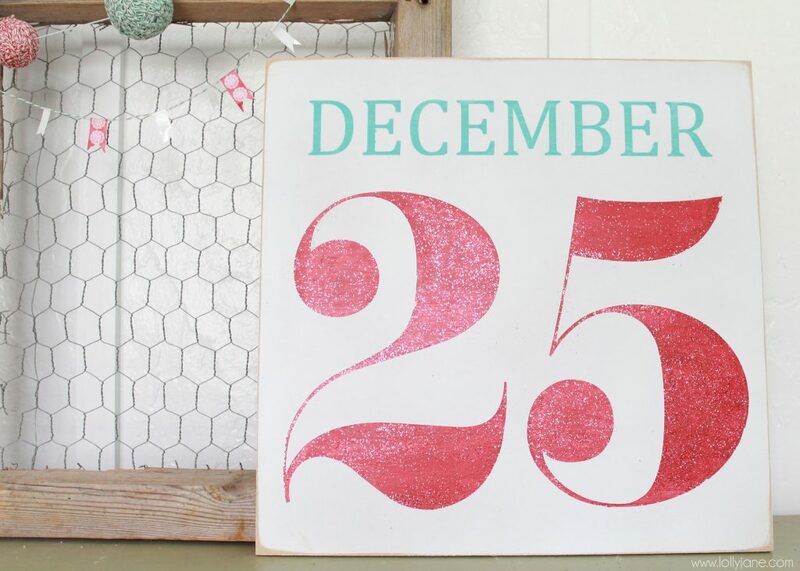 What great timing too – now I have all year plan out next year’s decor, surrounding my own white/aqua recycled wonder! 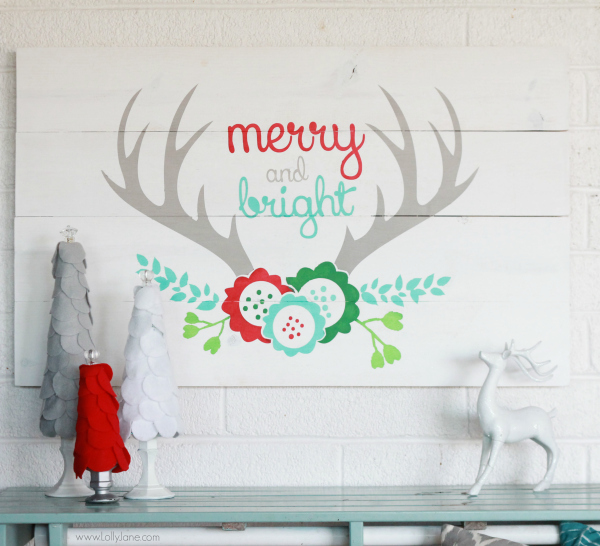 Thanks, & Merriest of Christmases to you and your loved ones ! Wow! From old to new in no time! Thank you for sharing such a colorful and creative idea. It looks awesome! Also, thank you for being a Discount Tire customer. We appreciate your business and are glad to hear we were able to help you get back on the road safely. – Merry Christmas from your friends at Discount Tire! Thanks so much, Discount Tire! 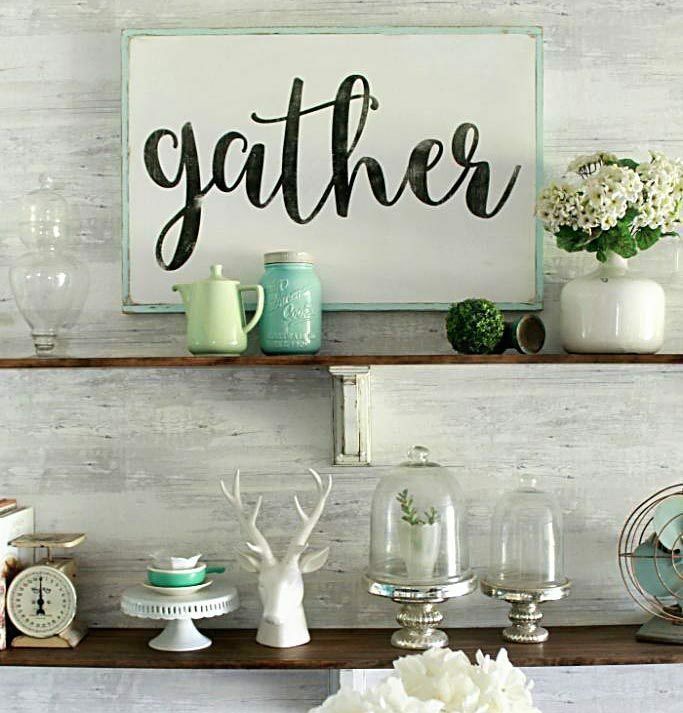 We were already loyal customers and love finding new uses for old things. Merry Christmas! Where did you buy the super cute houses?! 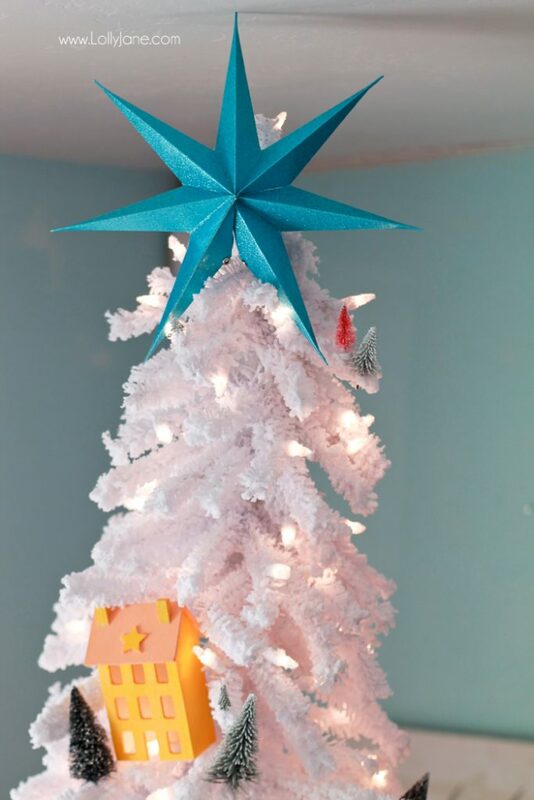 How tall is that white Christmas tree? It’s an 8′ tree, thanks, Diana! Help! I’ve been trying ever search phrase I can think of at Amazon to find those adorable house ornaments. Do you have any other specifics that would help me find them? I’d really appreciate it. Can someone help me here please, I want to subscribe to your blog but through the reading list when I open my blog to see my blogposts, how can I do that? We hooked you up! Thanks, Rasha!